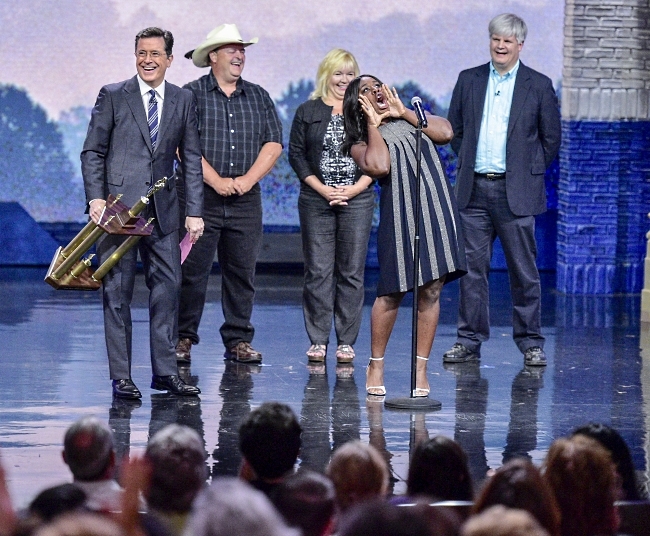 (L-R) Stephen Colbert, Robby Goodman, Sheila Frye, Uzo Aduba, and Tony Peacock at the First Annual Late Show Hollerin' Contest. In June of 2016, the folks behind Spivey Corner's National Hollerin' Contest decided to put an end to their festivities after forty-seven years. Not wanting the hollerin' to go silent, former Junior Hollerin' Champion Robby Goodman decided to start a new hollerin' competition in Hope Mills and kicked things up a notch by christening it the Worldwide Hollerin' Festival. We spoke with Mr. Goodman via email about the Worldwide Hollerin' Festival, winning Junior Champion at the National Hollerin' Contest, and appearing on The Late Show With Stephen Colbert. How did you get into hollering? My home was 5 mins down the road from it. You were named Junior Champion at Spivey's Corner’s National Hollerin' Contest when you were 10 years old. What was that like? It was the first thing I had ever won. Very exciting. Have you competed since then? How did you fare? I came in 2nd runner up in 2014 after 37 years. You recently had the change to show the world your talents on The Late Show With Stephen Colbert. What was that like? It was great! Met Uzo Aduba. Felt wonderful knowing that NYC was interested enough to help us not let it die! Tell us about folks will see and hear at the inaugural Worldwide Hollerin' Festival. A day of fun filled music, great food, and entertainment for the whole family. A day to let your hair down and forget about politics and the troubles that plague the world we live in and to renew our strength to fight another day! The National Hollerin' Contest at Spivey's Corner closed this year due to concerns that they were becoming a joke. Do you share the same concerns for your event? Not at all. I feel it had reached a place that it needed a breath of fresh air. I pray our efforts do just that! We added a twist to sponsor a charity, Wags4Tags. I am an 82nd ABN VET so I feel the charity was fitting and to open it up to the world. What happens if the National Hollerin' Contest comes back in 2018 to celebrate their 50th anniversary? Do you have a last man standing steel cage match to determine the best contest? Anything else you'd like us to know about the Worldwide Hollerin' Festival? We hope the public will come out and support the efforts of our people to keep a North Carolina staple alive and have fun doing so. I feel it will get better each year that goes by and we pray that the Lord's blessings and stamp of approval is on it! 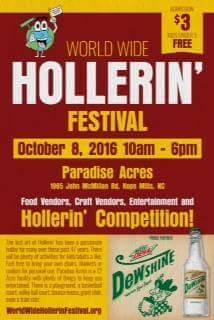 The Worldwide Hollerin' Festival will take place On October 8th, 2016 at Paradise Acres in Hope Mills. In addition to the hollerin' contest, there will be food, crafts, and music for folks to enjoy. If you feel you've got what it takes, you can register for the hollerin' contest here.